InterCor is ready for the 25th ITS World Congress, taking place in Copenhagen from 17 to 21 September 2018. 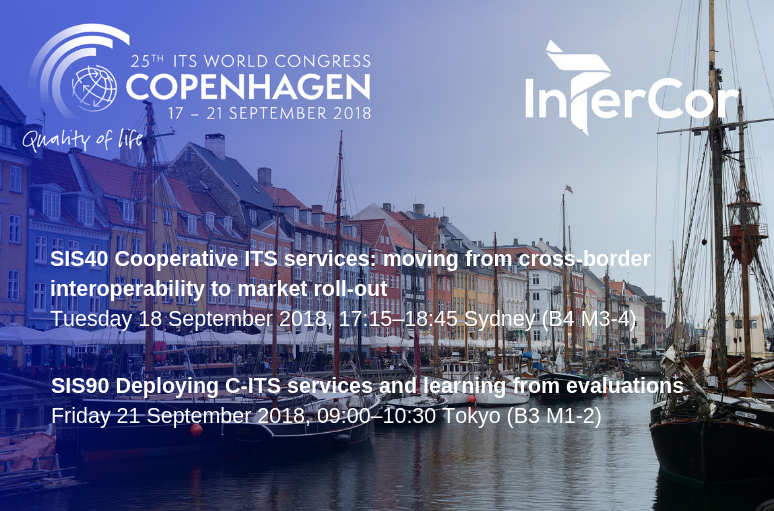 InterCor partners are organising a Special Interest Session entitled Cooperative ITS services: moving from cross-border interoperability to market roll-out. and participating in another session on C-ITS Deployment. SIS40 Cooperative ITS services: moving from cross-border interoperability to market roll-out. Building on successful developments and cross-testing, Cooperative ITS (C-ITS) services are now moving from pilot to large scale deployment: 2019 is hence considered as key milestone for the start of C-ITS market roll-out. This is a step change made possible by various industry sectors and political engagement on both national and EU level. During this session, current and upcoming experiences on cross-border interoperability testing of short-range Wi-Fi and cellular networks and their (hybrid) combination will be presented and discussed. Speakers will also unfold future perspectives for harmonized and coherent C-ITS market roll-out. Here the focus will be on organisational processes, including aspects like strategy, policy, procurement, standards and innovation. Gary Crockford, UK Department for Transport, will also give a presentation on the InterCor evaluation activity in session SIS90 – Learning from C-ITS evaluations – combining international perspectives on Friday 21 September 2018, 09:00–10:30 in room Tokyo (B3 M1-2). The story of Cooperative ITS in Europe is unfolding further and further. Deployment has really taken off, while automation of vehicles and – in a wider perspective – mobility is also getting into the picture. How can we maintain the C-ITS momentum and also contribute to automation that benefits the whole society? The Amsterdam Group facilitates cooperation between European infrastructure organisations and automotive industry for corridor-based harmonised deployment of C-ITS services. In doing so, it promotes interoperable deployment and provides an essential strategic cooperation element among implementers which complements the C-ITS Platform and C-Roads. Furthermore, funding for C-ITS invariably comes with a requirement to evaluate, but the challenges encountered and lessons learnt from actually delivering these are rarely published. The vast majority of the C-ITS evidence base is derived from modelling and work to combine different predicted effects. Published evidence from field operational trials is scarce, meaning there was no template to follow when developing our evaluation approach. At this session we will share what we learnt about C-ITS evaluation looking at three UK programmes – InterCoR, Compass 4D and a Department for Transport competition to promote C-ITS activity in English Local Authorities. Through sharing our experience we hope we can all learn more quickly what works when implementing C-ITS and how we can shape the future together. For the full congress programme please click here.